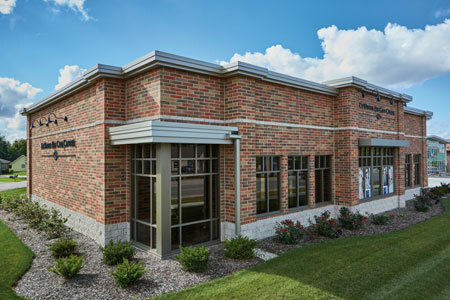 The new DeWinter Eye Care Center building is situated on a highly visible corner at the edge of downtown Muskego and sits within the City of Muskego’s Downtown Redevelopment District. This was all taken into consideration during the design phase. The owners emphasized they wanted to create a professional looking building that had a memorable impact to the public. The overall design goal was to have a sophisticated looking building without it looking intimidating or expensive, which reflects their business model of providing the highest level of care at a reasonable price. The building’s location within the Downton Redevelopment District meant it had to adhere to a specific set of guidelines created by the Muskego City Council. To meet these guidelines, the architect chose Heritage Collection™ Designer Concrete Brick with a smooth finish in a Palomino Blend Color, manufactured by County Materials Corporation. Heritage Brick was specified because it mirrors traditional brick aesthetics, reflecting the look of historic city center buildings, while also providing a cost-effective and durable solution. The architect incorporated splitface concrete masonry units in a salt and pepper color blend along the building’s base to represent an old stone foundation, anchoring it to the site. Splitface CMUs were selected as an inexpensive alternative to natural stone, and for their modular design which attributes to easier installation. Their light color is in stark contrast from the rest of the building, further accentuating the base. The same splitface CMUs wrap around the top of the building in a thin course, modeling a decorative band of white granite. Brick pilasters were installed throughout the perimeter, representing load bearing columns, adding to the sturdy feel of the building. The variety of masonry products manufactured by County Materials allowed the architects to specify products that achieved warm colors, crisp lines and the overall character the owners were seeking. Additionally, the diversity available in concrete masonry units provided options for the many design elements that met the redevelopment district’s construction covenants, at a cost-effective price. As a result, DeWinter Eye Care is a welcome addition to the district.